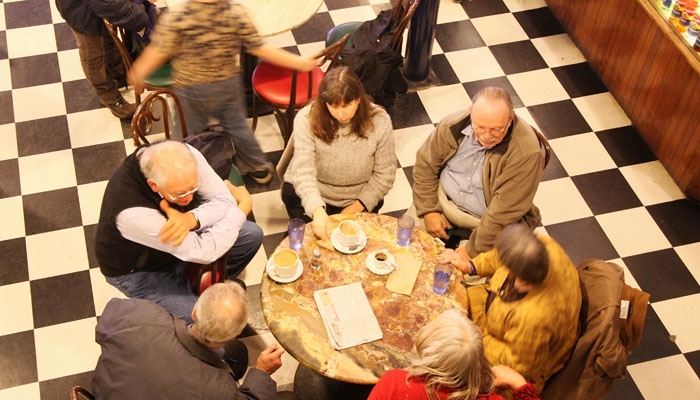 On any given day, generations spanning half a century can be found congregating at Caffe Mediterraneum on Telegraph Avenue. While much of Berkeley's history is found archived in books, fragments of the past remain in their original state at the historic coffee house. Still adorning the building is a mural that was painted three years after the Med opened in 1956 under the name Piccolo, a coffee station within a bookstore. Directly opposite the mural hangs a sign that reads, "Caffe Latte Invented Here." It was in the late 1950s that one of the Med's early owners, Lino Meiorin, made the latte a standard coffee drink. "Americans were not used to the strong flavor of Italian espresso, so Lino would keep saying, 'more latte'," said Craig Becker, current owner of the Med. "Finally, he decided to put a latte, a bigger drink, on the menu." One of the oldest coffee houses in Berkeley, the Med was also the first in the East Bay and one of the first in the West Coast to serve espresso, Becker said. Yet the Med's fame is rooted in more than its coffee grounds. The cafe served as the meeting grounds for radicals from Beat Generation artists to Free Speech Movement activists. "I would go into the Med and I would see somebody with a blue serge suit on and a big wig-it was Ginsberg, and I would say 'Hello, how you doing?'" said Brad Cleaveland, 76, a Berkeley resident who was a principal activist during the Free Speech Movement. "He was standing around a group of people sitting there, all talking intensely. I saw him lots over a period of two to three years." Apart from being the site where Allen Ginsberg wrote "Howl," the Med was used to film a scene of "The Graduate," a 1967 movie starring Dustin Hoffman. Up until the 1990s, the Med thrived as a center for conversation and caffeine. With another change in ownership in the new millennium, however, the Med took a turn for the worse. "It was bordering on a homeless shelter," said barista Samiya Shehadeh, a junior at Berkeley City College. "It was called the 'cockroach cafe.'" Dismayed by the thought of its loss, Becker, then a regular at the Med, bought the business in July 2006. Over the next two and a half years, Becker dedicated his efforts to improving the coffee by upgrading the equipment and using higher-quality, fairly traded and organically grown beans. The Med's business has not been affected by the recession, Becker said. "People are starting to come back that were drifting away, so that momentum is the same since the economic downturn," he said. "What we offer is a good product and an affordable product, so probably we're not going to be hurt as much as medium to higher price restaurants." Rogelio Franco, a manager who has worked at the Med for three decades, said that many customers keep coming back because it reminds them of a another time in history. "It's the only thing that has not changed-many places (on Telegraph) have changed," Franco said. "They remember the old times, they feel like they are returning to a time past. Some old-timers still come, but many people have already passed away." Not unlike the 1950s and 1960s, the Med continues to be a destination for activists seeking social change. On a weekend afternoon, Hillary Lehr, a recent UC Berkeley graduate, held a meeting to organize a DE-Cal aimed at democratizing the regents. "We've met here a lot for a variety of progressive and radical student organizing," Lehr said. "This place still has the smell of revolution, still has the atmosphere of conversation and engagement." Berkeley resident Al Hadad, 65, said he visits the Med several times a week because it is a place for ideas and discussion. "It goes beyond coming in for a cup of coffee," he said. "Coffee just sustains you-"
"-Gives you energy to talk," finished Marin Fischer, 73, a Berkeley resident who frequents the Med just as often.